Protect your private information as well as the environment – and be a part of history! The SDCCU Super Shred Event will be held from 7 a.m. to 4 p.m. on Saturday, June 16, in the SDCCU Stadium in northwest parking lot located at 9449 Friars Road, San Diego. 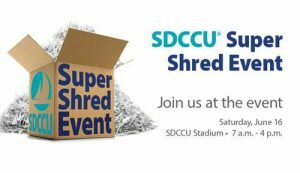 SDCCU is hosting another free shred event – and we need your help to make it our biggest ever! We will be attempting to once again break the Guinness World Records™ title for the most waste paper shredded in 8 hours, so bring all your old personal documents for shredding and recycling. There’s no limit to how much you can bring and everyone is invited! Shred-it®, the world’s leading document destruction and recycling company, will be onsite to shred documents at no charge. Paper documents should be removed from binders prior to shredding; however, staples and paperclips are okay to be shredded. Donations for SDCCU Stuff the Bus are appreciated. Visit sdccu.com/shred for more information.